For the past 9 weeks, The rising Bronx Mc G.Fisher has been releasing an unreleased exclusive from his vaults for his #FishFrys (FisherFridays) series. 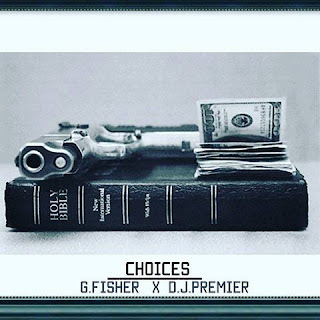 This weeks #FishFrys is an extra special DJ PREMIER produced Banger called "Choices" where Fisher gets to show off his immense story telling ablility. WORLD PREMIERED this past Friday by the legendary DJ Premier himself on his "Live From Headquorterz" radio show on Sirius Xm. Recorded in the legendary "DND STUDIOS" before it closed and slated for G.Fisher's mythical "God MC" project but never released because the track was used by Evidence from Dilated Peoples and also on Dj Premiers "Beats That Collected Dust" vol 1. Today G.Fisher and Dj Premier decided to open the vault and let the world hear " What a real MC sounds like"